They look so complicated, with their elegant crescent shape and proudly airy layers of rich pastry, tightly curled up and falling over one another. Breaking one open sends a shower of buttery flakes everywhere and leaves your fingers satisfyingly greasy. Surely, this type of baking is the preserve of the professional? Or the French? Croissants – good croissants – can be made at home, even by a Yorkshireman of limited continental patisserie related experience. Yes, it’s a bit of a faff. There’s a lot to do, and it pays to be precise and meticulous. Everything has to be nicely rolled out, squared up, evenly cut, rested, chilled… It takes some planning, and a lot of time, to say the least, but it’s worth it and it’s not particularly complicated once you get the hang of the processes. So, what’s in a croissant? Butter. Lots of butter. There’s dough as well, but it’s mainly butter. A shocking amount of butter, actually…all those who’ve harboured a faint hope that a croissant or two represented a healthy breakfast will discover soon that they were wrong. All a croissant is is a type of laminated dough…butter is rolled out very thinly between sheets of dough, and folded and folded to multiply the layers to make each leaf ever thinner and lighter. The layers explode apart in the heat of the oven, the butter soaked into the dough. It’s wonderfully simple. Start with the detrempe, or dough. This is simply a case of forming a dough from a kilo of strong white bread flour, 10g of fast action yeast, 20g of salt, 140g caster sugar mixed with 330ml each of warm water and warm milk. This dough is very soft and sticky, so it’s best to use a mixer with a dough hook to knead it, for about ten minutes. Rest the detrempe in the fridge overnight, covered with clingfilm. This long, cold rest allows the dough to ferment and develop. It’s where the flavour’s made. In the morning, first thing, take 500g of butter out of the fridge to soften slightly. The butter needs to be cool, but workable. or a knife to get the edges nice and straight and the corners square. OK, now for the dough. Roll it out into a rectangle just over twice the size of the rolled out butter, with an extra couple of centimetres around the edges. Carefully lay the butter on one side of the dough and peel away the clingilm. Lift the other half of the dough over the butter and use a rolling pin to firmly seal the three open edges. What you’ve got now is a block of butter encased in pastry. Turning this block of buttery pastry into a couple of dozen croissants takes a lot of rolling out and folding. Roll the pastry out until it’s the same width but twice the length, then fold each end in by a sixth, then again by another sixth. The folds should meet in the middle. Flip one side over on top of the other so that you’ve got a stack of eight folds. 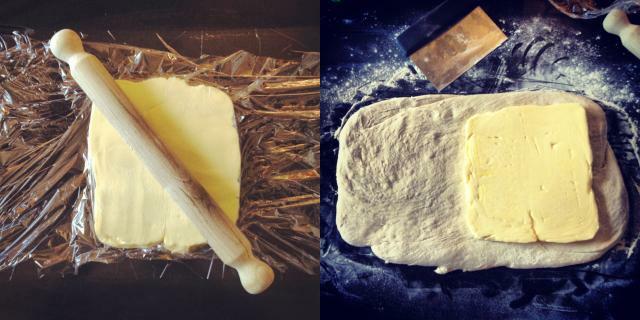 Use a rolling pin again to seal the edges and rest the dough, covered, in the fridge for an hour. The next roll-out is the big one. The dimensions are MASSIVE, so clear a big space and flour it well. Aim for 140cm by 50cm, dusting underneath the dough regularly to help it along the way. Try to be gentle, and try not to let the butter burst through or tear the layers. If it’s too hard to roll out, leave it at room temperature for ten or fifteen minutes to warm up a little. Keep the edges of the dough as straight as you can, then trim it to exactly 140cm by 50cm, then slice it lengthways in half lengthways into two 140 by 25cm strips. Mark each strip at 20cm intervals on one edge then again at 20cm intervals on the other side, but this time indented by 10cm on the first cut. Use a pizza cutter to connect the marks so that you’re left with neat triangles that are all 20cm at the base. There’ll be about twenty-four of them. Roll each one of the triangles up from the broad base towards the peak, so that the very tip is tucked underneath, as if the weight of the roll should keep it in place. Bend the ends of the roll inwards and, et voilà, a croissant. Repeat this rolling up process with the rest of the triangles and let them rest for at least a couple of hours on baking trays, until they’re almost doubled in size. Don’t crowd the trays. Brush with a glaze of beaten egg and bake for ten minutes at 200c before reducing the temperature to 170c and baking for another five to ten minutes. Keep an eye out for any signs of the croissants scorching or burning…they’re high in fat and do have a tendency to catch a little. Cover with some foil if things are heading this way. It’s important to eat at least one croissant while it’s still warm, when it’s at its absolute best, so make sure you do. The rest can be reheated in a low oven when needed, or given a very short blast in the microwave. Can’t wait. I will be getting the first train from London KX to get there in time for the first batch. Well done for doing them! I spent an entire weekend faffing about, chilling the dough etc and they were awful at the end of it. I personally blame the cookbook (baking with Julia by Dorie Greenspan) because the instructions were AWFUL. I was determined to make them again but I think I might use your instructions next time! Yum! They look so flaky and delicious! Oh WOW! These look fantastic! I may have to invade someone else’s kitchen to give these a go. I don’t have enough counter space! For now I will leave it up to the corner bakery. Fantastic job and great instructions. 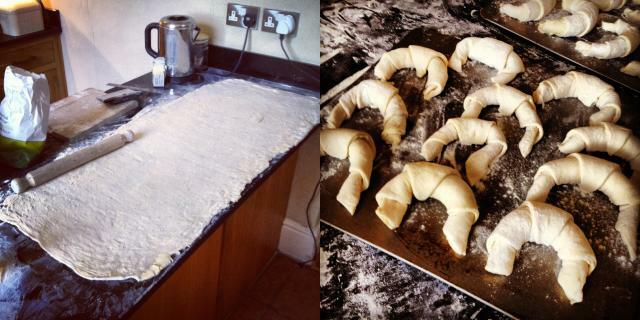 These look yummy, lots of work tho.Homemade croissants scare me. 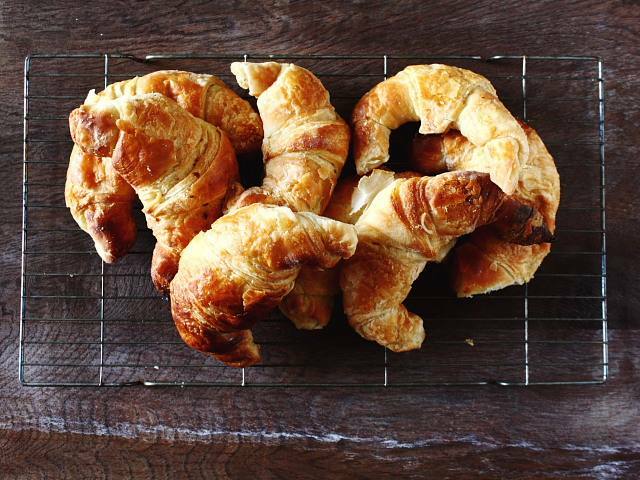 I have always wanted to make croissants but was so intimidated by the idea! These look amazing. I will have to try them out. Wow! Very impressive. Congratulations on making the foodbuzz Top 9! This is amazing! I love that you cleared an entire counter for this. Congrats on top 9! You’ve been buzzed. Beautiful! just beautiful I’ve always been afraid of making my own croissants – mostly a fear of guilt knowing how much butter would be involved. Now I’m quite tempted after seeing your delectable pics and effective method of instruction..
Oh Happy Day! You have inspired me to try making these again! Thanks so much. I made these years ago and felt like they were so much work. I suppose a combination of enough years and your wonderful photos have reeled me back into the idea! It is still a challenge for me. Nonetheless, wonderful explanation and picture. Lovely and so tasty looking. My husband and I were just talking this morning about how hard it really gets to find wonderfully perfect croissants. So many places are offering terrible imposters. Guess we may have to try our hand at making them ourselves.